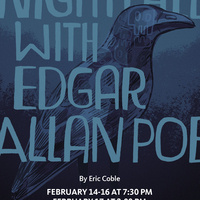 Oregon State University Theatre’s 2018-2019 Season: Literature Comes to Life continues with a chilling production of Nightfall With Edgar Allan Poe by Eric Coble. This journey into the psyche of the tortured author runs February 14-16 at 7:30 pm and February 17 at 2:00 pm in the Withycombe Hall Lab Theatre. Withycombe Hall is located at 30th and Campus Way on the Oregon State University Corvallis Campus. OSU Theatre student director Lindsey Esch leads a cast of OSU students including Patrick Miller, Cole Haenggi, Colin TaylorMays, Nicole McKinney, and Yihong Lu. The ensemble of performers concocts eerie renditions of some of Poe’s most famous works including The Raven and The Tell Tale Heart. Contact the box office for DAS accommodations and/or group ticket sales.